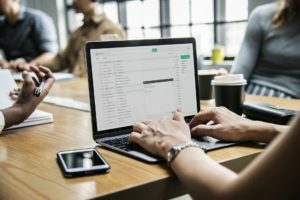 EMAIL MARKETING IS IT STILL RELEVANT? E-mail. It's by no means a new phenomenon. In fact, according to a recent global study, we send around 281 billion e-mails per day. It's unsurprising then, that e-mail marketing has established itself as one of the best ranked platforms for mass marketing communications. But it would seem since the recent, somewhat infamous, introduction of GDPR legislation, there has been a rise in the misconception that businesses are no longer able to contact prospect data using this channel. We are here to confirm that this is certainly not the case, as long as you comply with a number of regulations. In order to ensure you operate within the GDPR legislation, you must have a valid lawful basis in order to process personal data. One of six, to be precise and we can support you with this. The essence of effective marketing is to have the right message, to the right person at the right time. E-mail marketing can successfully facilitate this. Especially when you have the right platforms that enable campaign monitoring and enable to gain insights into; who has interacted with your campaign? What time are they doing so? How are they doing so - mobile or desktop? What product/service are they interested in? By obtaining these insights, it not only allows you to follow up with those engaging with your communications, but also to tailor your subsequent communications to that person, or segment, to suit these preferences. A huge challenge marketeers face is the saturation of inboxes with other marketing messages. By having these regular insights into engagement, you can continually improve your interaction rates, by subtly getting to know your target audience and their habits of information consumption. The core benefit of e-mail marketing is ability to share your message to a huge volume of recipients, for a very minimal cost. Especially when you compare the amount you would have to spend to achieve the same number of 'eyes on the prize' using another communication platform. Which shouldn't change your activity very much as why would you be targeting an audience who doesn't require what you do!? Here at Momentum, we can take care of this for you. (For more information on compliance with GDPR please click here). In answer to our original question, yes by all means E-mail is still a very relevant and viable channel for marketing communications. Here at Momentum, we offer multi-channel marketing solutions and work with our clients to build a strategy around their individual objectives. We have the time and resource to ensure our communications are analysed, followed up, reported and insights incorporated into the subsequent campaigns to achieve continual improvements. We work seamlessly with your business, specialising in the behind the scenes 'legwork' to provide you with genuine leads, enabling your sales team to do what they do best. Sell to pre-screened prospects with an identified need! Read more on our range of communication services, and talk to our team today to discuss our solutions for your Sales Growth aspirations. View our prior blogpost on GDPR regulations to find out more how we lawfully handle personal data, using the six legal bases of data processing. ← SOCIAL MEDIA. FRIEND OR FAUX?